Step into the ring with the WWE Hardcover Ruled Journal, featuring striking photos of WWE Superstars in action. 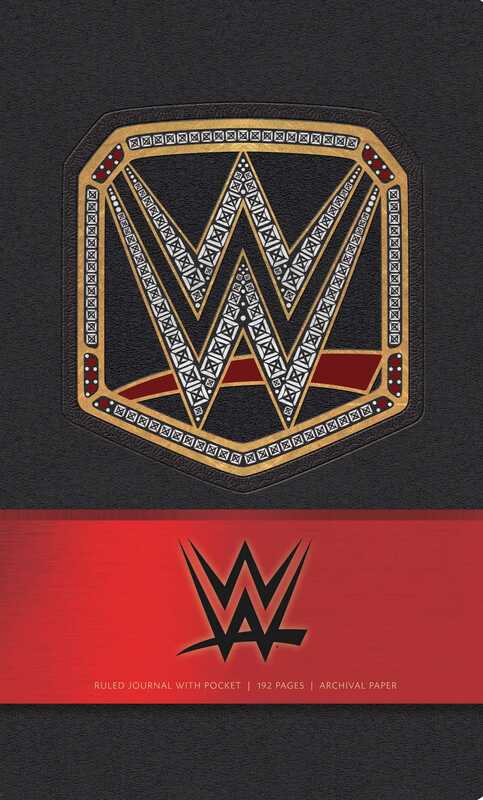 Celebrate the exciting world of WWE with this exclusive hardcover journal, featuring the iconic design of the WWE World Heavyweight Championship worn by the greatest champions of sports-entertainment. Featuring explosive imagery of WWE Superstars in action, this unique journal is the ultimate gift for passionate members of the WWE Universe. With sturdy construction and sewn binding, this journal lies flat, and the 192 ruled, acid-free pages of high-quality heavy stock paper take both pen and pencil nicely to invite a flow of inspiration. Includes a ribbon placeholder, elastic closure, and 7.5 x 4.5–inch back pocket, perfect for holding photographs and mementos. All WWE programming, talent names, images likenesses, slogans, wrestling moves, trademarks, logos and copyrights are the exclusive property of WWE and its subsidiaries. All other trademarks, logos and copyrights are the property of their respective owners. ™ & © 2015 WWE. All Rights Reserved.